The decades-old bus was bought as a personal toy for a man who lives on the Toronto Islands, and it's now being noticed by Calgarians in Ontario. If you visit the Toronto Islands, you might find an old-time bus that's a little far from home. The owner, Manuel Cappel, has it parked there, where he lives. He spoke to The Homestretch about how he went about restoring and relocating a coach that used to be a part of Calgary Transit's fleet, operating as bus No. 619. Cappel bought the bus when he was 65 and took it on the trip of its lifetime — and now it's getting noticed by Calgarians in its new home. "It's basically a private toy," Cappel said. "Once every two or three weeks I like to fire it up to keep it alive." He said most people who see the vehicle don't know it's a Calgary relic. But he's chuffed when he meets people familiar with the paint job. "I get people saying: 'Oh, I used to ride buses like that when I was a kid back in Calgary,'" he said. "I say: 'Yes, you may well have ridden this one.'" 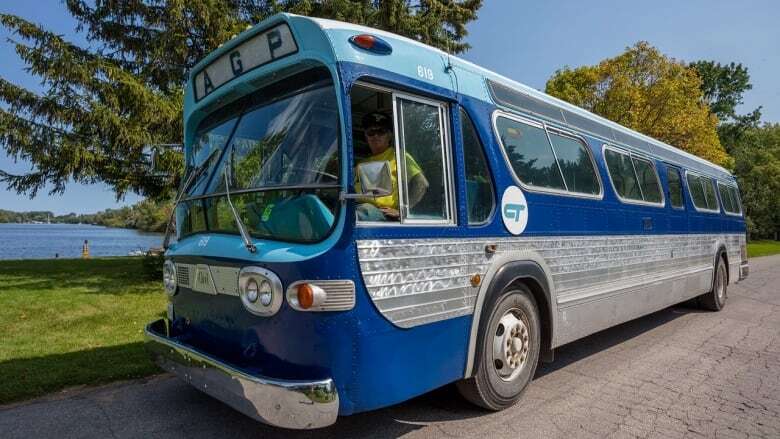 He's not sure what routes the bus took, but since it's been spotted by its former owners and operators who know about the set of wheels, he's hoping to find out a little about its history. From what he understands, the coach started off in London, Ont., in 1967. Its unique look is called the "fishbowl" — others might know it as a GM New Look. It stayed with Calgary Transit until the early '80s and then it was sold to Red Arrow Motorcoach, an Alberta-based company that is part of Pacific Western Transportation. Then it ended up as a shuttle for Spruce Meadows. In 30 years, the bus only had one driver, Cappel, said, so he's the coach's third operator. And, because it was in great condition, he took bus No. 619 on the trip of its lifetime — a little farther afield than southwest Calgary. "It was one of the great adventures of my life," Cappel said. "I love a road trip, and this has to be about the best one possible." Despite his enthusiasm for the journey, Cappel described the new-to-him ride as "ponderously slow." He explained it's a two-speed automatic transmission. So, he took the Trans-Canada Highway. "I'd roll along, pedal to the metal at about 85 kilometres an hour," he said. "Everything went just fine. There were very, very few mechanical problems with it and they were all very minor." He used to be a truck driver and loved driving big rigs. So he was able to drive six to seven hours a day, stopping for fuel for him and his bus. Cappel picked up hitchhikers, too, including two brothers in Medicine Hat who were heading home to Quebec City. He picked up another young man headed to Montreal. They were 20-somethings, so Cappel said they mostly kept to themselves, or were wrapped up in their smartphones, but were good company on the 11-day trip. "They got a ride clean across the country," he said. His hitchhikers helped him every day by washing the bus and sleeping on board as "security" while Cappel slept in motels. The bus itself cost $2,000. After an extra drum of oil and a mechanical checkup and insurance, it ran him an extra $600. Then, the drive from Calgary to Toronto was a $1,000 trip. In Ontario, it had to be inspected again, which cost him an extra $7,000. Then he wanted to return the No. 619 to its former glory. Because of the coach's time at Spruce Meadows, it was painted a green colour and didn't have its original transit logos. "That paint scheme was a little tired and faded," he said. His friend, who also loves buses, sent him a picture of its original stripes — the double blue scheme — and Cappel thought that looked terrific. So, now that it's repainted, he's looking for other ways to bring the bus back its former glory. And next on his list is a vintage fare box. It's called a Duncan fare box and he's hoping sooner or later one will pop up on eBay.